During UMBC’s 50th anniversary celebration weekend, alumni, faculty, staff, and students gathered for a lighthearted event to reflect on the student experience over the years at the university. 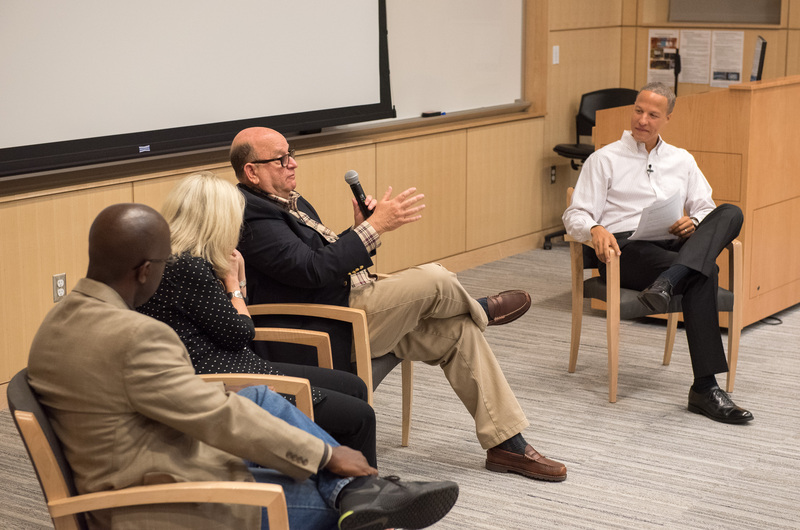 The panel discussion, led by George Derek Musgove ’97, history, associate professor of history, looked at how campus culture has evolved since UMBC was founded in 1966. 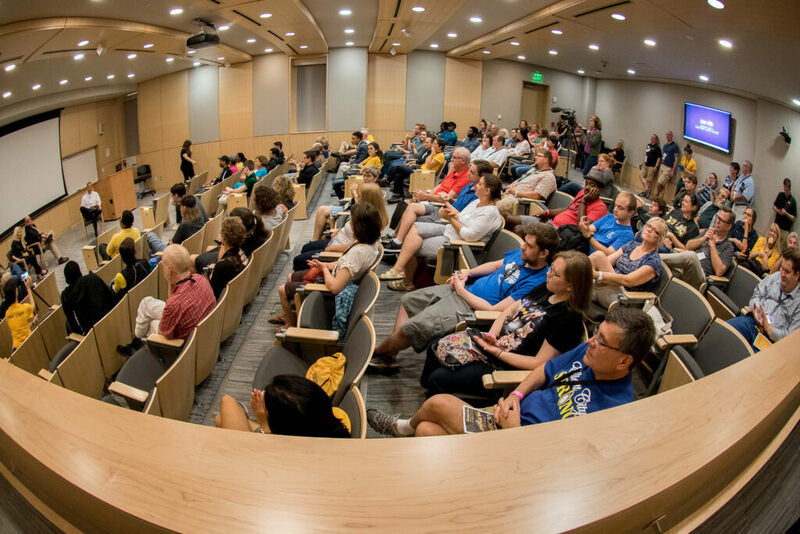 The event, titled “An Unofficial, Totally Tongue-in-Cheek, Slightly Zany History of Campus Culture at UMBC,” featured alumni Steven Fedder ‘72, American studies; Shari Elliker ‘83, interdisciplinary studies; and Oliver Myers (M1) ‘94, M.S. ‘96, Ph.D. ‘07, mechanical engineering, who all shared memories of their time as students. Steven Fedder talked about his experience being part of one of the first classes at UMBC when he arrived on campus in 1969 and reflected on how students in the late sixties and early seventies helped lay the foundation and shape the campus culture at the university. Shari Elliker explained how she became involved with the campus radio station, eventually becoming the station manager, which helped sparked her interest in her career. As a member of the first cohort of the Meyerhoff Scholars Program, Oliver Myers talked about his moving experience when he met President Hrabowski for the first time and how it inspired him to work even harder as a student. “[Dr. Hrabowski] has some form of connection with just about all of us that relates to us on an individual level,” explained Myers. Myers explained how the Meyerhoff Scholars would frequently gather for study sessions to talk through homework assignments and described how the students would always engage with scientists and other professors when doing site visits at laboratories. “We were asking serious questions about developing cures for cancer and how we use composite materials in the mechanical engineering lab. We were asking questions to national laboratories about rocket development and robotics,” shared Myers. As a Meyerhoff Scholar, Myers said he frequently had the opportunity to meet with top officials when they visited campus, which offered him unparalleled opportunities to connect with world leaders in science and government. Following the panel presentation, several alumni in the audience engaged with the panelists in a lighthearted discussion about their student experiences over the years at UMBC. To watch the complete event, click below. Images: Top: Oliver Myers speaks during the event; Middle: Steven Fedder talks about his experience as a student. All photos by Jay Baker.